Pneumonia is a respiratory disease. It is basically a chronic respiratory condition where the patient breathes germs into the lungs and finds it difficult breathe because of obstructions in respiratory passage. 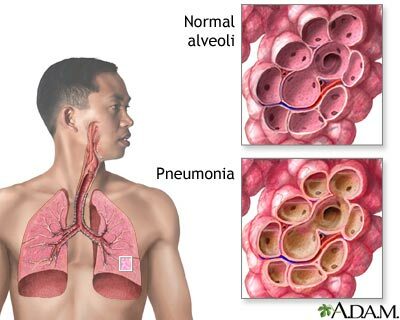 This is an acute infection caused in one or both the lungs which is caused by a bacterium named Streptococcus pneumonia. Pneumonia is a pathological consequence caused by the abnormal entry of fluids, particulate matter, or secretions in the lower airways. There can be several reasons behind the cause of this respiratory disorder which varies from the places where the patient has contracted it; however viruses and bacteria are the primary causes of pneumonia. The cause of the disease is important to know because the background of the illness helps to determine the patient’s successful recover ability rate to a great extent. When a person accidentally breathes in the germ into the lungs, these germs inhabit in small air sacs of the lungs known as alveoli and continue to multiply. And as the immune system of the body tries to send white blood cells to fight the infection it is then instead of warding off the infection the sacs become filed with fluid and pus resulting in pneumonia. The Pneumonia can be caused by bacteria, fungi, and as well as viruses. There are several symptoms that help to indicate this disease; however the symptoms differ by the way they are caused. Feeling extremely exhausted or feeling very weak. Cough which spits up mucus (sputum) from your lungs which can be rusty or green or tinged with blood. Then it is accompanied by Chest pain which keeps getting worse when you cough or breathe in. There might be some shaking accompanied by “teeth-chattering” chills. 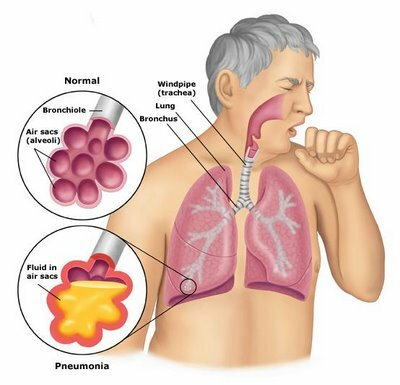 What are the treatments of Pneumonia? 4: The DTP Injections for Whooping Cough. What are the Risk Involved in Pneumonia? And these risks are more prevalent in hospitalized patients, very young children or old people, patients with weakened immune systems or chronic medical conditions etc.